Celebrating fifty years of Wild and Scenic River designations by Congress, this film festival showcases frontline issues and activism with stunning cinematography. Now, more than ever, it is imperative that individuals propel the groundswell of the environmental movement. Collectively, we CAN make a difference! 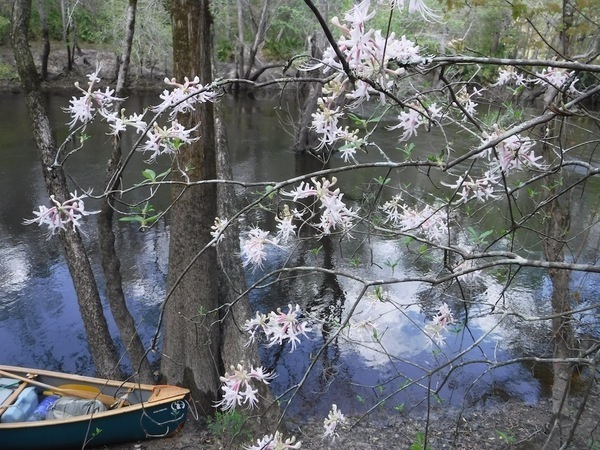 There aren’t any Wild & Scenic rivers in the Suwannee River Basin, although maybe after seeing this film festival, people will be motivated to fix that. We have river gems unknown even to most of the people who live here: the Alapaha, the Little, the Withlacoochee, and the Suwannee River. Some Atlantans paddled the Alapaha River Water Trail last month, and confirmed its A+ rating for scenery. Even portaging around a deadfall didn’t dampen their spirits. Consensus: we love the Alapaha! But, though small, the Little turned out to be big with beauty. It was bordered by loblolly pines and live oaks, with water elm, river birches and willows on the banks, and with large cypress and Ogeechee tupelos growing in the channel itself. The trees were hung with Spanish moss, and some of the oaks supported gardens of resurrection ferns on their big branches. Under the trees, swamp azalea was in full bloom, its blossoms ranging from white to pink. Occasionally I’d glimpse a farm field in the distance, but the farther I went downstream, the more stately the forest became, protected in a widening swamp. Photo: Burt Kornegay, of Native wild azaleas, Rhododendron canescens. Photo: John S. Quarterman for WWALS of Sugar Creek Landing on the Withlacoochee River at Gornto Road, Valdosta. How can the river of the state song of Florida be wild? Well, you’d be surprised how many Floridans don’t even know where it is. And along much of its path its banks are owned by the state. Probably most people know the Okefenokee Swamp is wild, but downstream of there in Georgia and Florida, the Suwannee can still surprise you, as it flows past almost all woods for tens of miles, and it can get cold, as some Canadians found out a year ago. You can paddle with us Saturday May 12, 2018 from White Springs to Woods Ferry and be really prepared for the movie. This is a picture of the take-out. Doesn’t that look wild? Photo: Beth Gammie on Southwings flight for WWALS 2016-11-23 of Woods Ferry Tract Launch. There are only two Wild and Scenic Rivers in Florida, the Wekiva River and the Loxahatchee River. There’s only one in Georgia, the Chattooga River, way up in the northeast corner of the state. Because nobody has tried to lobby a state legislature or governor for such designation. The most obvious rivers in WWALS territory are the Alapaha, Little (below the Reed BIngham SP dam), Withlacoochee, and the upper Suwannee. All of them (except the Little) cross the GA-FL state line, and thus would require lobbying two governors and two legislatures, plus a bunch of federal agencies. There’s only one organization likely to do that: WWALS. We did toy with the idea a few years ago, but got buried in pipeline mess. Maybe after people see the Wild & Scenic Film Festival, enough people will be motivated to do this. The obvious reasons to want Wild & Scenic River designation are beauty and tourism. Even more basically, such a designation would get more people who care about the rivers to use the rives, taking care of them. In Massachusetts, Congressmen Barney Frank and Jim McGovern succeeded in having 40 miles of the Taunton River designated as Wild & Scenic. This was done, in part, as a strategy to defeat a proposed Hess [liquid natural gas] LNG facility that was slated to be developed on the banks of the River. 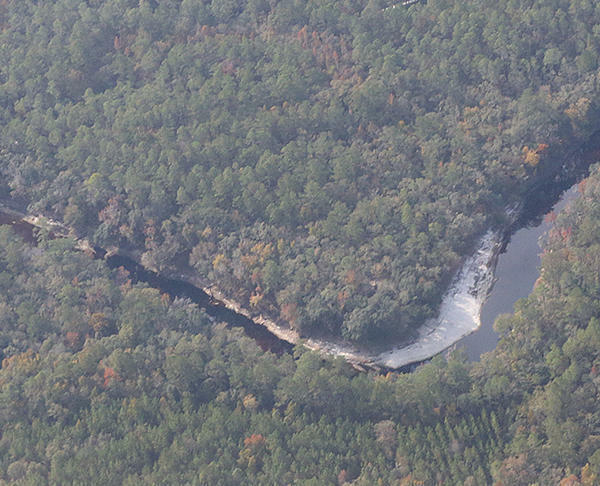 If the Withlacoochee, the Suwannee, the Santa Fe, and the Withlacoochee (south) River had been designated Wild & Scenic Rivers, it would have been harder for Sabal Trail to gouge its pipeline under them. It would be harder now for the German company Strom, Inc. to site its containerized LNG export facility near the Withlacoochee (south) River in Citrus County, Florida, right where a spur of Sabal Trail goes. Such a designation would make factory farming operations think twice about running an effluent pipe into a river. There is a legal process for designation, set forth in Section 2(a)(ii) of the Wild and Scenic Rivers Act of 1968. The short version is a state governor applies to the U.S. Secretary of the Interior, who notifies the Federal Energy Regulatory Commission (FERC) and publishes the application in the Federal Register, followed by more federal agencies and another publication in the Federal Register. If I’m reading it right, the state legislature has to pass a resolution in there somewhere. Clearly both Florida and Georgia have done this before, so it is possible. For a river or river segment to be eligible, there are various requirements, starting with it must be free-flowing (no dams or channelizing), and a state or more local political subdivision has to administer it without expense to the federal government. There are 20-mile segments of the Alapaha and Little Rivers that are wild (1), most of the Alapaha, Little, Withlacoochee, and upper Suwannee match (2), and the rest of the Suwannee matches (3). We have not been completely idle. We have persuaded quite a few counties and cities in Georgia to pass resolutions in support of the Alapaha River Water Trail and the Withlacoochee and Little River Water Trail. Those resolutions and the contacts made because of them could be the basis for a further effort for Wild and Scenic Rivers designations. In Florida, Madison and Suwannee Counties and I think some others have passed a Resolution in Support of National Water Trail Designation of The Suwannee River. That could be the basis for an effort for W&S deignation of the Suwannee, at least if we can also get the affected Georgia counties (Clinch and Ware) also involved. They might. And maybe think about getting out on our rivers and helping to protect them. This entry was posted in Quality, River, WSFF and tagged Alapaha River, Alapaha River Water Trail, ARWT, Chatooga River, conservation, Georgia, Little River, Lowndes County, Loxahatchee River, Mathis Auditorium, north Florida, quality, river, south Georgia, Suwannee River, Suwannee River Wilderness Trail, Suwannee Riverkeeper, Valdosta, watershed, Wekiva River, Wild & Scenic Film Festival, Wild & Scenic River, Withlacoochee and Little River Water Trail, Withlacoochee River, WLRWT, WRWT, WSFF, WWALS, WWALS Watershed Coalition on May 3, 2018 by jsq.